Monkey Business: Discover Hurk, a new character and quest giver, and his 4 unique missions. The Lost Expeditions: 2 Missions and a World War II Flare Gun. The Hunter Pack: The M700 hunting rifle and its three skins. The Predator Pack: 4 exclusive rare predators and a multiplayer bow. 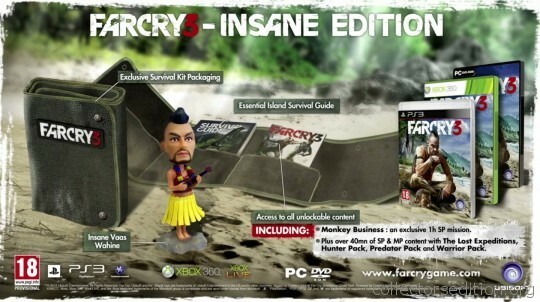 In UK, you can preorder the Insane Edition at Gamestop, Game, Play, and Amazon. In Australia, you can preorder the Insane Edition at EB Games. This entry was added to the database on Friday, June 29th, 2012 at 2:34 am by Xmo. This information was last updated on Saturday, May 7th, 2016 at 8:54 pm by . Wow...really like this EC... Want it!!! There is a very little chance this will be quite as limited as those two. But this edition is looking very good indeed. Just need a price. It's been taken down. I still think it's a fake. Many Collector's Editions are promoted using Photoshoped or CG images. Everyone remember Crysis 2 Nano edition, the bag looked very different to the actual item received. I find it hard to believe that store create listing of fake items, they get heir information from the publisher after all. Not from News sites. Just waiting for any news of opening preorders anywhere to check it's real..